Patients can lose most or all of their teeth for a variety of reasons. The most common is periodontal disease (gum disease) and tooth decay. Often, these problems occur from inconsistent oral hygiene and poor nutrition. When this happens, complete dentures are created to restore the patient’s ability to chew and speak properly. 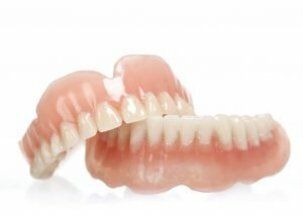 Dentures are appliances molded to fit each individual’s mouth, and are made of various materials. Upper dentures have a flesh-colored center piece that covers all or most of the palate (the roof of your mouth). Lower dentures are U-shaped and allow space for full usage of the tongue. In both pieces, the teeth are typically cast in porcelain, plastic, or both and are set in acrylic. They are removable, and must be cleaned with special solutions. Any remaining teeth also must be removed. In some cases, the gums and tissues are allowed to fully heal before the dental appliance can be worn. In the case of an immediate denture, teeth are extracted the denture is placed in right away, allowing the tissues to heal under the denture’s application. Over time, the fit and function of the dental appliance will change, making regular check-ups important for denture patients. Gum lines shift and recede, and jaw bones can adjust and move. Patients must also be diligent about cleaning and care to prevent gum disease, just like patients with natural teeth. Regularly scheduled checkups are a must!